Paramedics must perform rapid assessments when responding to any emergency medical situation. Understanding a patient’s condition is critical to making a more informed decision to improve outcomes, but a high-stress environment and the need to process a lot of information quickly can sometimes lead to a misdiagnosis. Challenged to reimagine the ambulance of the future, five MIT students — Paolo Adajar, a mathematical economics sophomore; Eswar Anandapadmanaban, an electrical engineering and computer science junior; Jordan Harrod, a PhD candidate studying medical engineering and medical physics; Samuel Salomon, a chemistry, biology, and physics junior minoring in nuclear engineering; and Erica Yuen, a mechanical engineering graduate student — designed a solution they think can help paramedics more accurately identify patients who are in critical condition. AugMedic is an integrated sensing system that simplifies vital sign monitoring. There are five vital signs that can indicate worsening trends in a patient’s health — heart rate, respiration, blood pressure, oxygen levels, and temperature. With the AugMedic system, the sensors are placed on a stretcher and integrated through a processing unit that displays the patient’s vitals automatically on a portable tablet. The interactive interface also allows for the input of qualitative patient information and provides assistive questioning that offers recommendations to investigate a patient’s conditions based on existing protocols. In addition, the system compiles the paramedic’s entry data and vital signs to automatically fill out post-call reports, saving time and allowing the technician to move more efficiently between calls. The idea for AugMedic was developed over the course of a four-day span during which time the team ate, slept, and worked together inside a glass cube housed on the MIT campus. Their effort was part of InCube, a global startup competition that took place Sept. 20 to 24. The students began the challenge by interviewing over 40 people to understand the problem space. Through the interviews, the students were surprised to learn how unintegrated the ambulance system was, which led them to design a more simplified structure. InCube invites students to live the full entrepreneurial journey and work towards finding an innovative solution to a societal challenge that could be turned into a successful startup. The notion of doing it while inside a glass cube is intended to draw the public into the process, foster transparency, and provide a platform for interactive engagement. Conceived by a Swiss-based student association, the ETH Entrepreneur Club, the appearance of the novel workspace at the Institute marked the second time the InCube experiment has been conducted. After the success of the first edition in Zurich last year, the student organizers brought the idea to host the first U.S.-based cube in Cambridge to the MIT Innovation Initiative, which helped co-organize the event. On Sept. 20, the five teammates, who had just met for the first time the prior week, stepped into a tiny 270-square-foot cube that was set up with a small workspace on MIT’s North Court to compete against four other teams in Switzerland — two in Zurich, one in Bern, and one in Crans-Montana. Each of the cubes was supported by a private company, institution, or foundation that defined a problem for the team to solve. 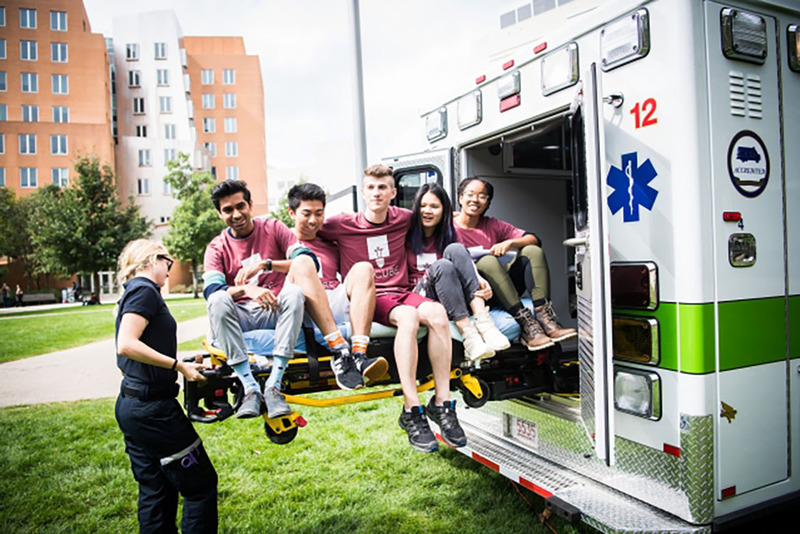 Stryker, a medical technology company, sponsored the Cambridge cube and unveiled their challenge to design a better ambulance to the students on the first day of the competition. After four days of working around the clock, the team pitched their idea for AugMedic in front of a camera which was broadcast at the finale event in Zurich on Sept. 24. Based on the quality of their concept and the marketability of their idea, the judges awarded the MIT team second place. When asked what it was like living and working with people he didn’t know in such close quarters, Solomon says he thought being strangers “kind of helped because we came in with different backgrounds and mindsets. Yuen says hackathons are a great vehicle to collaborate intensively on a project, but most are not long enough to go deep into problem-solving because the limited amount of time doesn’t allow for the validation of ideas. “InCube was different though because its entire premise was based on design thinking and not just on making technology that works, but technology that can actually be applied and utilized to solve problems,” she says. With the intellectual property of the design owned by the team, the students are planning to continue working on AugMedic and have plans to try and push a startup forward.